During the past several decades, the City of Indianapolis, through the use of taxpayer subsidies and "public-private partnerships" (i.e. corporate welfare), has attempted to pick the best course for economic development in the City. Inevitably that involves government officials, aided by "friends" in the business community, making decisions where to spend taxpayer dollars to encourage economic development they hope will happen. Let's look at just a few examples. I'm sure people can think of quite a few more. CITY MARKET: Every few years, the City tries to "reinvent" the city market. Instead of letting the marketplace determine what is the best businesses for the city market, the City tries to encourage particular uses of the marketplace that inevitably fail. NORDSTROMS: The upscale clothing store was a poor fit for the downtown Mall. So why did Nordstrom locate downtown? Perhaps because of the substantially reduced rent it received, thanks to the City. Even with that subsidized rent, it has found it can't make it. NORTH OF SOUTH (No-So) DEVELOPMENT: Buckingham Companies could not find a lender to finance its mixed use project on the near south side just on the edge of the Lilly campus. Each lender said it was too risky, in particular there was no demand for more hotel space. City officials though decided they can outguess those who risk capital for a living. As a result, we taxpayers are now on the hook for $100 million. 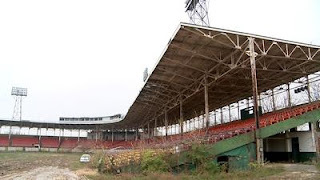 BUSH STADIUM DEVELOPMENT: Today, the City announced it is financing at least $6 million to help develop old Bush Stadium into apartment lofts. The location of these apartments is in an sparse industrial/commercial area on the near northwest side, not far from some of the most depressed neighborhoods in the City. Of course, no lender would have financed this project without the City putting the taxpayers on the hook for a large subsidy. Then we have the Lafayette Road development, where scores of wonderful ethnic restaurants have sprouted up on their own because of cheap rent and a diverse population. The City, spotting this success, has decided it needs to get involved to help drive economic development in the area. I'm reminded of what Ronald Reagan said were the nine most terrifying words in the English language: "I'm from the government and I'm here to help." The fact is government officials, who are not in the business of assessing risk and the whims of the marketplace, are not as good at it as the professionals who do it as part of their livelihood. While government does have a role in improving infrastructure and creating the environment for economic growth to take place, when government becomes a player in the game it goes too far. Every so-called economic development apparatus of government should be dismantled. All government knows how to do is take money from the masses (or indebted the masses) and give it to the privileged few. Government can only distort the marketplace despite all the lip-flapping about a government project spurring development. Generally, it only spurs misguided development or subsidized development. It is all just a game where a few win and many lose. Some people still don't realize they are the losers, but they will one day.